I just love the look of all of the sweet and simple, single tier cakes that I have been seeing lately. There’s something that is so innocent and fresh about them. Don’t even get me started on extended tier and double barrel cakes! I had to get in on the action. This one that I created is an extended tier vanilla cake with chocolate ganache filling, iced with vanilla buttercream, and covered in a thin layer of pure white fondant. 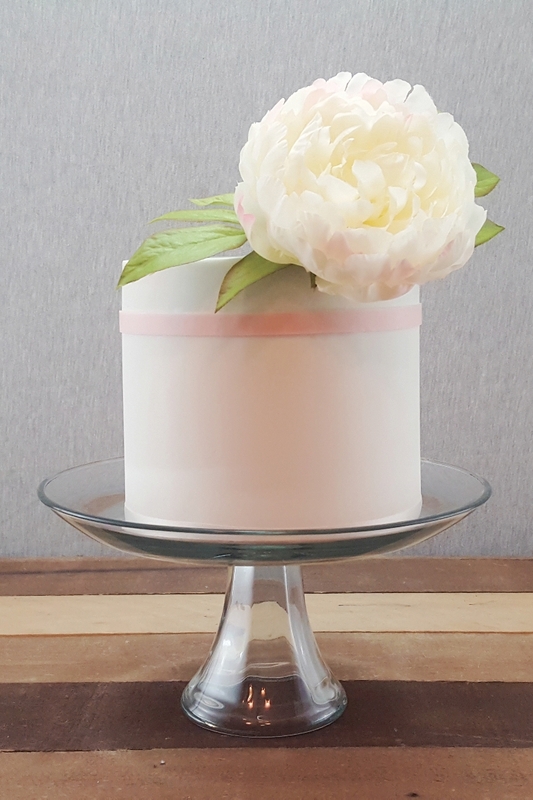 I topped it with a large white peony with hints of pink, which I pulled from for the light pink stripe around the top of the cake. Talk about springtime in a cake! I love this look for a bridal shower or wedding. This look would simply be sweet perfection on the dessert table at a baby shower.